In a cooling cycle of a refrigeration system, heat is absorbed by the vapor refrigerant in the evaporator followed by the compression of the refrigerant by the compressor. The high pressure and high temperature state of the vapor refrigerant is then converted to liquid at the cond. It is designed to condense effectively the compressed refrigerant vapor. 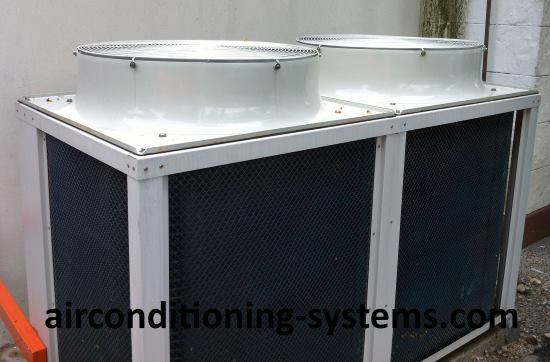 There are basically three types of condensing unit depending on how the heat is removed by the condensing medium which is usually water, air or a combination of both. 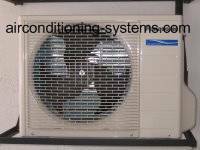 Air-Cooled types are usually used in the residential and small offices applications. They are used in small capacity systems below 20 tons. The advantages of using this design include not having to do water piping, not necessary to have water disposal system, saving in water costs and not much scaling problems caused by the mineral content of the water. It is also easier to install and has lower initial cost. There isn't much maintenance problems.The disadvantages are that it requires higher power per ton of refrigeration, has shorter compressor life and on days when most cooling is required, the least is available. A condensing unit that contains finned coils, fan and compressor. The circulation of air-cooled type can be by natural convection or by forced convection (usually using blower or fan). Due to its limited capacity, natural convection is used in smaller applications such as freezers and refrigerators. In forced convection, air is circulated by using a fan or blower that pulls the atmospheric air through the finned coils. Internally, the refrigerant circulates through the coil and air flows across the outside of the tubes. Water-Cooled There are 3 types commonly being used. They are shell and tube, shell and coil, and double tube. The most commonly used is the shell and tube type and are usually available from two tons up to couple of hundred tons. This design has lower power requirements per ton of refrigeration and the compressors can last longer compared to the air-cooled type. A water cooling tower is frequently used for higher capacity application. Evaporative type which is a combination of water and air-cooled. Two bigger capacity air-cooled condensers being installed in an open area. Air-cooled type operates at higher head pressure or condensing pressure, hence reducing the capacity of the compressor and increases the power intake. In general, a 2 hp water-cooled system will require the same refrigeration as a 3 hp air-cooled system. The maintenance costs of water-cooled type is about three to four times the air-cooled type. Air-cooled type maintenance is usually limited to regular lubrication of fan and motor bearings. Water-cooled type requires cleaning from algae and bacteria. Scales on the tubes are removed by using acid compound. Proper water treatment is also critical to the operation of the cond.